Take a day trip to Bakharden, 90km (56 miles) west of Ashgabat. The underground mineral lake (known in Turkmen as Kov Ata, which means "father of lakes") is fed by hot springs and has a constant temperature of 37°C (97°F). Bathing is permitted although there is an admission fee. Accommodation is not available. Enjoy the natural splendour of the Chuli Valley, a popular mountain resort. Accessible by taxi or private car, the drive takes you through a picturesque gorge and up to the cooler air. Visitors hoping to hike and climb can do so by arrangement, and there is even the opportunity to stay here. Spend a day at the races: in spring and autumn, horse races are held at the Hippodrome in Ashgabat. A colourful spectacle of speed and agility, there is no public betting. For those wishing to get closer to the stallions, 10km (6 miles) south of Ashgabat is the national Turkmenbashi Stud Farm where the Akhal-Teke horses are bred. See the ruins of the famous mosque, revered for its striking mosaic tiles and 8m-long (26ft) dragons, at the modern town of Anau. 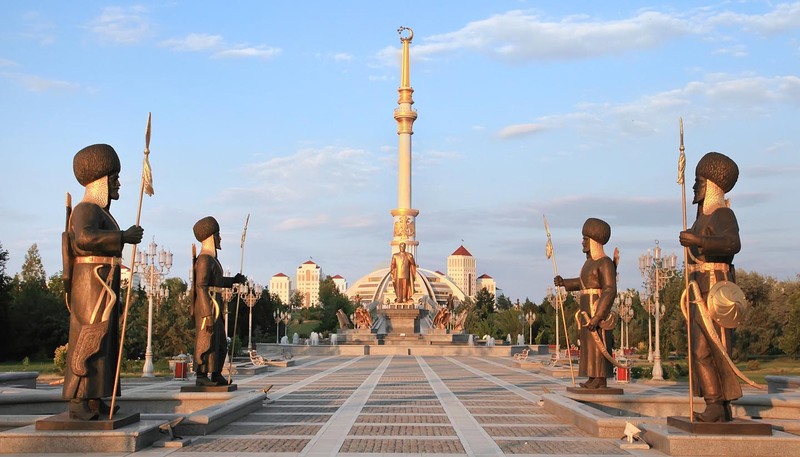 Once the site of the destroyed 15th-century city (whose fortress watchtowers can still be seen today), Anau is a short drive, 20km (12 miles) east of Ashgabat. The Turkmenistan capital stands on the southern rim of the Kara-Kum desert. Visit to see magnificent white marble Palace of Turkmenbashi, take in the museums, including the carpet museum and the National Museum of Turkmenistan, and hit the viewing platform of the Arch of Neutrality, a 75m- high (246ft) monument with a revolving golden statue of the late President Niyazov. Mary is Turkmenistan's second city and other than its Regional Museum there is little to recommend here. However, it lies near the remains of the city of Merv, which was once the second city of Islam. Known as the "Queen of Cities", what survives are brick-built mausolea of rulers and holy men – including the impressive Mausoleum of Sultan Sanjar from 1140. Dashgouz is the largest city in the northern region of Turkmenistan. The main sights are outside the city but include: the ruins of Konye-Urgench, an ancient fortress town with 14th-century relics; Kutlug Timur Minaret, one of the tallest minarets in Asia at 67m (220ft); and the mausoleums of Sultan Tekesh, Turabeg Khanym and Najm-ed-din Kubra. Situated on the shores of the Caspian Sea, Turkmenbashi (formerly Krasnovodsk) was a Russian creation. Built as a bridgehead for the campaign to subdue Central Asia, it later became the terminal for the Trans-Caspian Railway. Today visitors can enjoy panoramic mountainside views, good beaches and swimming, while the Museum of Regional History and Natural History makes an interesting stop. Uncover the delights of the Silk Road, the ancient trading route used by silk merchants from the 2nd century AD until its decline in the 14th century. The Tolkuchka Market in Ashgabat, the historical cities of Konye-Urgench and Merv (especially the windowless Kyz-Kala castle) and Kugitang Nature Reserve's dinosaur footprints are among the must-sees along the road. An organised tour is advised. Turkmenistan is home to the Akhal-Teke horse, a special breed known for its speed and intelligence. They occupy a special place in Turkmen culture and are a source of great national pride. Saddle up just outside Ashgabat, to ride through the gorges of the Firuza River and to the local hot springs. Rides can be arranged through local tour operators. Discover the remains of Old Nisa, the capital of the Parthian kings who ruled from the 3rd century BC to the 3rd century AD. Overseeing an Empire that included Iraq and stretched as far as the Syrian Arab Republic, their might, which prevented the Roman Empire from progressing east, can be seen in the UNESCO-listed fortresses of Nisa.